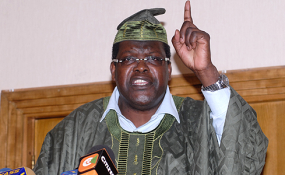 Firebrand lawyer Miguna Miguna claims to have filled a suit against the Kenya Airports Authority (KAA) and Emirates Airlines. In a tweet - his preferred platform of communication since his deportation a year ago - Miguna said he is suing the two companies for unlawful detention, assault, battery, torture and sedation. "As I mark one year in forced exile, I've today filed a lawsuit against Kenya Airport Authority and Emirates airlines for unlawful detention, assault, battery, torture, and sedation. Although KNCHR and my advocates have refused to enforce court orders in my favour, I'll return," Miguna said in a tweet on Thursday. Senior Counsel @orengo_james has been yelling recently of how Kenya's next president is @UKenyatta's "personal secret weapon." That is retrogressive nonsense. Kenyans will and must CHOOSE all their leaders including its head of state and government FREELY in credible elections. Miguna was first deported to Canada days after he administered an 'oath' to ODM leader Raila Odinga during a mock swearing-in ceremony held at Uhuru Park grounds on January 3, 2018. He was denied re-entry, detained at the Jomo Kenyatta International Airport (JKIA) for 72 hours before he was deported for the second time on March 29. The government claimed he was a Canadian national, arguing he never re-applied for his Kenyan citizenship after the promulgation of the 2010 Constitution. Two months later he sued the government and sought to be granted unconditional re-entry into the country. In December 2018, the High Court awarded him Sh7 million as compensation for the violation of his rights during his deportation to Canada. In the ruling, Judge Enoch Chacha Mwita said Mr Miguna's deportation was unlawful and in violation of the Constitution.